Medilink has provided input to draft zero of the WHO Discussion Paper on developing voluntary global performance targets for road safety risk factors and service delivery mechanisms. The WHO action is part of a series of global initiatives deriving from the United Nations General Assembly’s declared Decade of Action for Road Safety (2011–2020) and the Sustainable Development Goals’ target to halve road deaths and injuries by 2020. Medilink’s Dr Rania Saad, a former staff member of the WHO and a regional data coordinator for the 4th Global Status Report of Road Safety at World Health Organization, provided our response to the draft discussion paper. Dr Saad has significant professional expertise and a personal interest in the sector and has been involved in some 10 road safety projects in Egypt funded by Bloomberg. Among the points Medilink raised on the draft paper was the need to define the parameters behind some of the proposed targets; for example, the need for a globally-understood definition of what constitutes ‘serious injury’ and further clarification on issues relating to the rural vis a vis urban targets proposed. Medilink has gathered significant experience and data of its own over the years, in part through our pioneering of an Emergency Alert Response Service (EARS) in both remote areas – where regular A&E is not available – and urban areas. The service is installed in client vehicles and automatically triggered if the vehicle is involved in a collision. It gives clients with staff working in remote areas immense peace of mind. Member States, UN organizations, intergovernmental organizations, NGOs and private sector entities were invited to share their comments and suggestions related to the Draft Zero of the WHO Discussion Paper which closed on 16 December 2016. 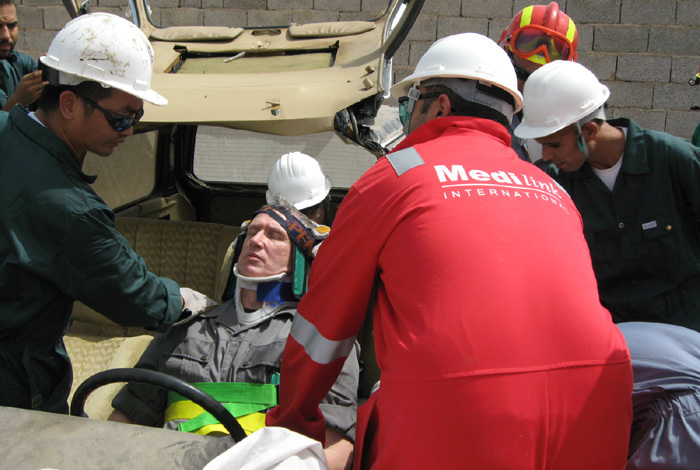 Medilink contributed as a non-state actor with expertise and experience in providing first responder medical services across the globe through its own direct capabilities and those of our extensive partner network of service providers. According to UN figures, over 3,400 people die on the world’s roads every day and tens of millions of people are injured or disabled every year. Children, pedestrians, cyclists and older people are among the most vulnerable of road users. The WHO works with partners – governmental and nongovernmental – around the world to raise awareness of the preventability of road traffic injuries and promote good practice related to addressing key behaviour risk factors, such as speed limits, drink-driving, the use of motorcycle helmets, seat-belts and child restraints. The plan establishes indicators to measure progress in each of these areas. Governments, international agencies, civil society organizations, the private sector and other stakeholders are invited to make use of the Plan as a guiding document for the events and activities they will support as part of the Decade.